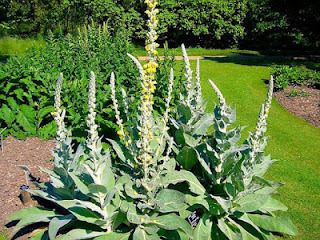 A large plant with light green leaves with elongated flower cluster. This cluster is packed with small yellow flowers and rests atop the terminal shoot of a robust wooly stem. The similarly wooly, large, oblong leaves of this wildflower begin at the base of the stem and alternates up.